If you ever go to India, Rajasthan is where you want to be. It’s vibrant, colourful, and totally absorbing with bright textiles, sunshine, smiles, and coffee lining the streets. The abundance of rooftop cafes, beautiful hotels, food, and markets will have you transfixed, and if that isn’t enough, the amount of ancient temples and palaces is almost enough to make you want to abandon your plans and live there for the rest of your trip. While Udaipur was my favourite place because it's so unique and great and I just loved it, the rest of Rajasthan has also been unforgettable. Over the last week, we’ve gone from jumping around the monkey-infested ruins of Bundi Palace channeling Mogali, seeing the Ghats of Pushkar, and taking a tour around Jodhpur’s incredible Mehrangarh fort (often described as the most magnificent in India), to drinking the world famous Makhaniya lassi at the Mishrilal Hotel, to staying inside Jaisalmer fort, and riding out in to the sunrise on an overnight camel safaris. Rajasthan is where it’s at. But of all those experiences, I’d have to say the camel safari was the most exciting. Not because the trip included riding camels out into the Thar desert by sunrise, roasting chapattis over the fire, watching the sun set over sand dunes, or sleeping under the stars of Rajasthan, but because it all went wrong. It was all booked and paid for, and we did spend about 14-hours trekking out into the desert on camels while eating amazing food, getting sore legs, watching deer sprint in all directions, battling hungry sheep, drinking Kingfisher from a 15-year-old beer monger (who just so happened to pop in...in the middle of the desert...), listening to the guides sing to the beat of a water drum, watching fighter jets patrol the Indian boarder, and setting up camp 70km from Pakistan – so that part went well, but there was a solid decline in the mood when some army guys showed up. I would actually go as far as to say it killed the mood. They were all speaking Hindi, so it was difficult to discern what was actually going on, particularly because the guides kept telling us it was fine, and the Indian tourist doing the safari with us was saying it was pretty far from fine. Turns out that part of the desert is a sanctuary that requires both an entry and a camping permit. The guides were saying they had permits, while the army guys were all like ‘you don’t so we’re going to fine you’, the guides were going ‘if we pay the fine can we stay?’, and army guys said ‘not unless you pay a bigger fine’, and the guides said ‘that’s ridiculous, we have a permit’, and then the army guys were saying something about a hunting permit and we got confused. I'm unsure as to what actually happened, but I thought it was odd that they were saying the Lonely Planet-recommended safari company had been doing their dealings illegally for 23-years. The manager of the company also said they deposit their permit fees every month without fail, and the temporary permits the army gave us after we paid the fines were actually hunting permits – written in Hindi so we couldn’t read them. It all looked pretty suss from the outside – official-looking guys show up demanding money and saying the word ‘court’ a lot, even though the company had permits. As a group, we decided to leave. Since that was our accommodation for the night, we went back to the guesthouse attached to the safari tours hoping they’d give us a place to stay, and the manager was very accommodating and apologetic. He gave us a room and water free of charge, and said he’d give us a refund for the safari if we wanted. Despite what happened, the guides were really fantastic, and the camel ride through the sand dunes was something we’ll never forget, so it was well worth it, and today my legs, back muscles and stomach muscles have decided they don’t want to function normally, so riding camels the next day probably would have been less enjoyable anyway. We woke up, asked for half our money back, and decided to spend the day eating cake. From Kanyakumari we finally moved out of Tamil Nadu and in to Kerala: the land of many beaches. The beaches are picturesque, the beer is flowing, the water is warm, and that all would have been great if I wasn't sick, but it was great nonetheless. We stayed there for two-days sipping juice in this massive (massively cheap) two-room apartment, staring at the beach while eating fish, before catching the bus to Alleppey: houseboat land. A valid attempt to get on a houseboat was made, but at the end of the day it was 6,000 rupees for one night on a boat, or 6,000 rupees for six-nights elsewhere, so after speaking to some French tourists at our hotel (Cherukara Nest: I highly recommend it), we did a canoe tour of the famed Kerala backwaters instead, which is organised by Cherukara Nest. The tour involved breakfast and lunch at a family home containing possibly the most confident, intelligent, and forth coming 11-year-old I’ve ever met. Sanjeev aspires to be a women’s Ayurvedic doctor, likes to sing, and has spent the last seven-years speaking to tourists and subsequently learning nine languages. Straight after the canoe tour we were on a bus to Fort Kochi: a small fishing town full of home stays and Christian festivals. Our main introduction to Kochi involved being stuck in a bus behind two giant parades, and witnessing many religious celebrations in brightly-lit churches on the side of the road, which seemed to attract hundreds. It was here that we stayed with two Swiss girls (who had crazy eyes – crazy eyes are a thing, and they had them), saw giant Chinese fishing nets, and had a truly amazing curry while being eaten to death by mosquitoes. I bought a skirt, we saw a traditional Indian dance, then got on a ‘semi-sleeper’ bus to Mysore at 11:30pm from the side of a highway. It was on this trip that I combated motion sickness with beers and Travelcalm (do it – you’ll sleep for hours), and woke up in what is said to be ‘the soul of the south’. We saw the famous Palace, went to one of the nicest bazaars we’ve been to yet, I made a stellar stick of incense (“I’ve seen lots of tourists make incense, but never as good as you” – incense-making teacher guy, who totally doesn't say that to everyone), and we drank lots of beer while making important decisions about our trip. We decided to catch a bus along a pothole-infested road for two-hours (I spent most of the trip in the air. I'm not joking.) to Bylakuppe, seeing the Buddhist Golden Temple (carrying 65L bags), then getting back on that bus to Kushalnagar (interestingly, the road conditions didn't change in those few hours, so again I spent it in the air), changing there for a bus to Hassan (road conditions still didn't improve), and changing there for a bus to Halebid where, again, we were really just paying for airspace because none of it was spent sitting down. We don’t make decisions with beer anymore. Halebid: don’t get there at night. It’s a tiny, dusty town with not much in the way of streetlights, making it kind of terrifying to arrive in after dark. It’s only real claim to fame is the absolutely spectacular temple in the middle of town which makes it well worth the trip. It’s all made of soapstone, and was constructed using the locking method – without bonding materials like cement – and it’s still standing. It’s by far the most intricately carved temple we’ve seen to date. We then caught a bus back to Hassan (don’t sit at the back of the bus or you'll fly), an old lady told me my clothes were too revealing (I was wearing long sleeves…), we visited a tourist office for an hour trying to figure out how to get to Hampi, and took an impromptu trip to Bangalore: India’s technological capital. We saw palaces, parks, forts, huge doors, went to a rooftop restaurant, looked around, drank $2.50 rum, ate like Maharajas, looked around some more, bought nothing, and got on an overnight train to Hampi with a very inquisitive family of three. The father had been to the U.S and Europe so had an idea of the kind of place Australia might be (which was a refreshing experience), and told us about Hampi and various other places. The mother didn’t speak much English, the daughter (15?) apparently watched me sleep, and Hampi was lovely. It’s a tourist den, but a nice villagy one surrounded by hundreds of temples and monuments. They said to see it all in three days. We did it in one. On a motorbike. 'Tired' doesn't even come close. “Climb the mountain with me,” Chris said. “It can be your birthday present to me”, he said. So we climbed the mountain, met around 13 monkeys, Chris tried to scare the monkey away, the monkey stole my water bottle from Chris’s hand, the monkey started sizing Chris up, we retreated from that part of the mountain, fearless-monkey-passing-warrior-girl (or strange-and-oblivious-laughing-girl who didn't even notice the monkeys, depending on how you look at it) came down the mountain, we stashed away the remaining water bottle, gathered strength and fearlessly passed the monkeys to get to the temple on top of the mountain, watched the sunset from said mountain, climbed down mountain, and I rode a motorbike. We met Bernadette and Mira – a mother and daughter from Switzerland, chatted to them for a while, ate the best vegetable paratha on planet Earth, and met them again at 5:30 the following morning on the train station en route to Goa – the trip that will forever be remembered as that time Chris’s birthday happened on a train. He agrees it was a great experience full of late transport, train food vendors, seedy men, lukewarm chai, three-hour bus rides, and the worst samosas to date, but we got to beautiful Palolem to see the sunset and eat whole snapper by the water with $2.50 cocktails. We stayed in bungalows and wiled the day away with coffee, breakfast, clothes shopping, and hammocks, then left after two nights in an overnight ‘sleeper’ bus to Mumbai: Worst. Trip. Ever. The bus is set out like a set of double bunk beds in the bus, and we were on the upper level. Took Travelcalm too early, sans beer – bad idea. Felt weirdly tired, out of it, and kind of drunk for the whole 15-hours, and Chris just couldn’t sleep. The roads weren’t great, so you’d wake up to find yourself in mid-air, knowing your back was going to hurt within seconds, and knowing there was nothing you could do to stop it. So we got off the bus feeling exhausted, and in the middle of nowhere. Turns out the bus didn’t go all the way in to Mumbai, so taxis were conveniently placed at the ‘dropping point’ (the side of a highway) asking for extortionate prices to get into the city. All the hotels on our list were full and/or extremely expensive, so we spent about two-hours walking the streets of Mumbai with huge bags, trying to find a hotel. Eventually we stumbled across one for 3,000 rupees/night, and decided we could only afford to stay in Mumbai for one night. Everything is supremely expensive in that city. Beautiful, but expensive. It’s full of old gothic architecture from the days of the British Raj – walking through the city is like stepping through time. 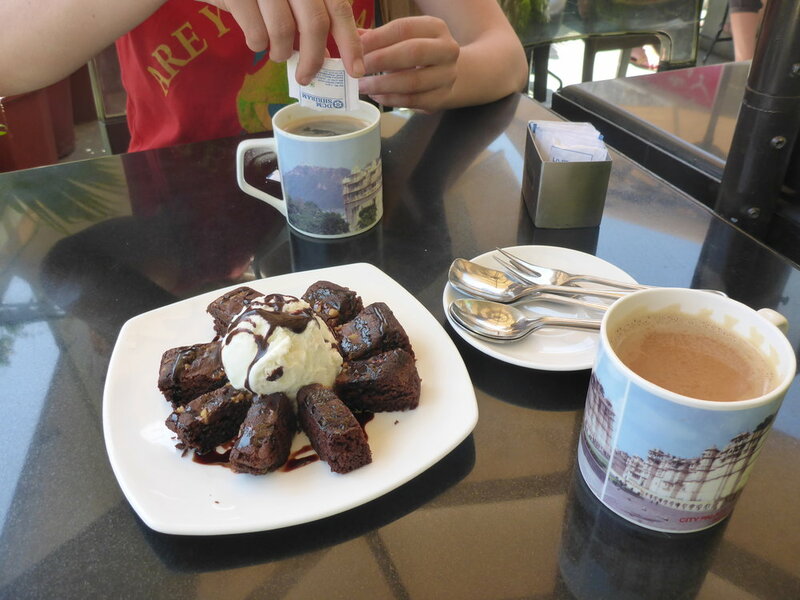 We had breakfast/lunch in a cafe swarming with tourists. We were seated up the back in front of a mirror lining the entire back wall – a mirror which we soon noticed had an enormous bullet hole. Turns out we were in Leopolds – a popular tourist den where the 2008 terrorist shoot-out occurred. People died. It was on the news. We sat there and chatted over coffee. We then headed to the ‘Gateway of India’ where the monolithic Taj Palace Hotel stands looking out onto the horizon. We later found out that’s where the terrorist attacks begun, half the Taj was destroyed, hundreds of people died. That was on the news too. Despite all that, it is beautiful to look at, and they’ve since gone to town with the security. We spent a large portion of the next morning in one of the many French patisseries Mumbai has to offer, eating cakes, scrambled eggs, and biscuits for Valentines Day, before I went into a shop looking for a descent punjabi to wear around, came out with a Kermit the Frog singlet from the menswear section, and headed off on the train to Aurangabad: the trip where Chris made many, many new friends. While Indian people pronounce my name as ‘Salad’ without batting an eyelid, they have strange reactions to Chris, or ‘Krish’, as they pronounce it. These reactions range from mildly confused expressions, to loudly vocalising, “What a stupid name”. We originally thought it was because it’s an abbreviation of the Hindu god Krishna, but no. Chris’s train friends informed us ‘Krrish’ is actually an Indian superhero, with shoulder-length dark hair, and pale-ish skin – like Chris. Having a name like 'Krrish' is the Bollywood equivalent of having a name like 'Batman'. Nevertheless, the guys on the train were fascinated with him. Questions ranged from ‘what is your salary?’ to ‘how long do you bathe for?’, until half the carriage was watching in fascination, as Chris tried to go about explaining the value of the Australian dollar and why we're not all millionaires, and the duration of his showers. 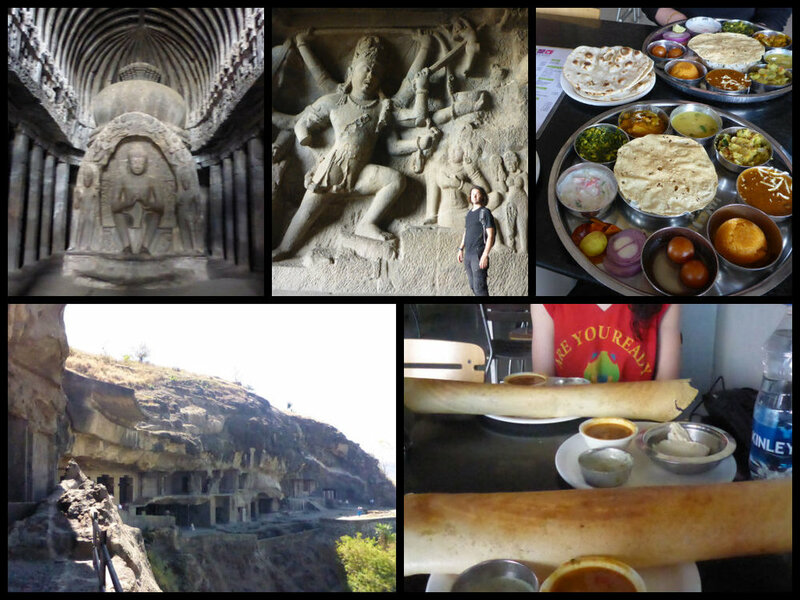 We finally got to Aurangabad, stayed in a less-than-ok hotel, had what I'm pretty sure was the greatest thali ever, the biggest dosa known to human-kind, and visited 12th Century caves the next day in Ellora – a trip which is definitely worth doing. Like Hampi, there are a lot of carvings to see, but you actually can do them in about a day. From there, we moved north to Udaipur. We were hoping to catch a train straight there, but no, the transport system doesn’t allow for that, so we caught a 14-hour overnight bus to Ahmedabad. Got there at 9:30am, had to catch a train from there to Updaipur at 11pm. We would have explored Ahmedabad, but we were exhausted, and it took the auto rickshaw driver two-hours to figure out that he didn’t know where the student internet cafe we wanted to go to was, so we ended up at ‘Four Point’ – the very obliging fancy-pants hotel restaurant that let us sit there for 11-hours using power-points and internet. It was great. After travelling almost everyday for so long, it was great to sit somewhere, order coffees, catch up on whatever was happening in the rest of the world (the Olympics are on? ), and not have to rush off anywhere. The food was also pretty fantastic, and their coffee came with biscuits. Win. We got to the train station at about 10pm, found our platform, got on the train early to ensure no one took our seats (though the seating is ‘reserved’, it happens frequently), went to sleep and woke up freezing. Multiple times. Everyone else had blankets and we were jealous. We had jumpers, long sleeve things, and socks, but it wasn’t enough so we were just cold until we finally got to Udaipur at 9:30am. We spent the day eating cake and looking at leather-bound notebooks, leather bags, shoes, jewellery, saris, and buying blankets and clothes (for the next train trip...), before going to this amazing Indian-fusion restaurant (vegan and gluten-free options are on the menu). We had Indian tacos, vegan curry with stuffed potato, garlic wheat chapattis, hyderbadi biryani, and beer. It was amazing. For the first time in two-days, we slept in a bed that wasn’t moving. Nukkad Guest House is the bomb – fork out for the rooms at the top, it's absolutely worth it. Congrats on reading this far! You deserve some kind of medal.